It is extremely difficult to correct a wide angle shot taken at an angle to straight geometric shapes, such as trees or buildings. Lens Corrections>Manual>Transform probably has all the tools, but in some photos it would take a computer to know which ones to apply and in what order. The Straighten Tool in the Crop panel is brilliant (and has been around in PS for years). Can we have something similar in Lens Corrections, where the user would draw a few straight lines in the image (essentially telling LR what's a building and what's a tree), and LR would attempt to apply the right Transforms to straighten the photo? It is really a good idea! Thanks! I agree -- it should be possible to draw two lines that should be vertical to set both the rotate and vertical sliders, or to draw two lines that should be horizontal to set both the rotate and horizontal sliders. There is no "Force parallel" feature in Camera Raw as in DxO Optics Pro 6.x. Raw Converter has instruments to correct lense distorsion, but its not so comfortable as drawing to lines on photo, that must be parallel! Camera Raw/Lightroom: "Force parallel" vs. "Lense Distorsion Correction". In the crop tool of lr 3.4.1 there is a spirit level. You can mark two points in a tilted line, ét le voila, the line is perfectly horizintal or vertical again. Very intuitive. The anti-distortion tool i see in 3.4.1 is horrible. It does it ́s work, but you need too much time to get a rectangle again. My wishlist-entry for LR4 is a comparable easy anti-distortion tool. You mark the 4 corners of a distorted rectangle (window, building etc.) and the tool makes the windows a perfect rectangle again, according to Scheimpflug rules. Lightroom: More intuitive anti-distortion tool for LR4. The perspective correction feature is nice, but very difficult to control because you have to juggle at least two sliders in most cases (rotation, horizontal). It would be nice if there were a better user interface for this. For example, perhaps it might be possible to draw two lines on the image (similar to the 'ruler' tool in crop view when rotating) and have it set the necessary sliders to make those two lines parallel. Lightroom: perspective correction user interface. P.S. As far as I understand, Lightroom already applies automatic aspect ratio corrections when using the perspective sliders. The corrections depend on the angle of field, i.e. on focal length in relation to sensor dimensions. That seems to work well - however, it would be nice to be able to tweak it a little bit. Edit: To illustrate what I mean in the P.S. two pictures with exactly the same amount of manual correction (vertical=-93, horizontal=0, scaling=50). The first one at 12mm, the second one 135mm focal length, both on an APS-C camera. Note: This perspective correction is for test purposes only and makes no sense for the photos. Clearly, LR applies a different aspect ratio depending on the focal length. I would like to see a better function to correct perspective problems in Lightroom. It have been using DXO Optics Pro for several generations and it always had a better way to do that: Just click 4 points in your photo and "force to rectangle" - voilà! In Lightroom (also still in v4 beta) it is often not possible to get a satisfying result with the geometry tools Vertical/Horizontal correction as there often remains a skewed image. 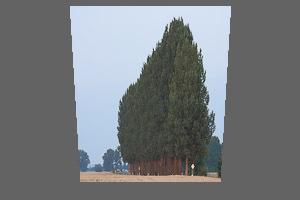 Lightroom: Perspective correction / Force to rectangular. In Lightroom, I would love to have the option to correct vertical perspective by clicking on points of vertical lines, adjusting rotation and vertical shift accordingly. Should be simple to implement and would save users a lot of time! Lightroom: Straightening vertical lines should be automatic.. It looks like something similar was added to Photoshop 6 beta. I saw a demonstration of it for a merged panorama. It looked unnecessarily difficult to use. LIGHTROOM: lens correction similar to drawing an angle in the crop tool: but instead you draw two vertical lines on 2 things that should be vertical in the photo (eg the 2 sides of a house taken with a wide angle lines and camera tilted up, the walls of the house converge). it should be possible to adjust the vertical transform until the lines are parallel, and then rotate the whole image until they are at 90 degrees to the baseline. I've used the lens corrections / manual transform option to adjust perspective in LR3 (and briefly in LR4). Although it gets the job done, it seems to me to be an exercise in frustration to get it right... each transform seems to impact another dimension. For an easy to use corrective tool - try the GIMP (need to tick the "correct" option) you just drag the mesh onto the straight lines in your image (no matter how skewed, and it corrects those lines to vericals and horzontals. If the vertical or horizontal compression is off (usually only with excessive transforms) then you just run a separate single axis expand or compress. Much quicker to use. 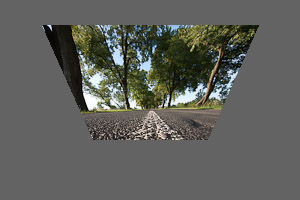 Lightroom: Mesh based perspective correction. Yeah, this would be easy, and VERY helpful. LR already has the guts to do 3D perspective transformations, it just needs a UI, similar to the rotation alignment tool, but allowing 2 or 3 lines to be drawn instead of 1. I STILL think we need this feature. The upright corrections often fail with interiror shots, which actually makes the process longer on the whole - often I will click on basic, click on auto, click on vertical, then click on off, click on manual and do the lens corrections. OY! I concur. A possibility for manual correction by drawing lines (horizontally/vertically only, or complete "keystone correction") would be really nice for the cases when the automation does not work very well (don't get me wrong: the automation is great). This reply was created from a merged topic originally titled Please add a corner pin, grid or warp distortion tool to lightoom. It would be nice to be able to just corner pin an image to fix perspective issues. When the auto tools fail its time consuming to adjust h and v sliders to get the right effect when just pinning two corners would achieve the same result in seconds.